Not having done any serious winery visiting for so long I had forgotten that generally in certain countries in Europe they don’t really show visitors vineyards. I have a number of theories about their reasons for this. The first is that a lot of the time cellars are not on the estates the vines grow, partly as it is more important to use land for vines but also as originally the vineyards were owned by the church and then split amongst the people in the villages by Napoleon. The second theory I have is that with so many vignerons owning vineyards in essentially the same area they can rarely claim a terroir as their own, and must therefore talk about their expression of the terroir. Another theory I have is that there is an assumed understanding about their appellation and terroir, and there is very little need to show the vineyards. The final reason is that generally visitors are more interested in either flash wineries (Bordeaux) or cellars, and of course in tasting the wines. So it is with disappointment that after three days and seven appointments already I have only had one of my hosts show me vineyards. This is the case in France and Germany, but less so in most of Italy, Spain and Portugal. I took it upon myself to drive around the vineyards of Vouvray to get acquainted with them, but it isn’t the same without someone pointing out specifics like viticulturist practices. My first visit for the day was with Bernard Fouquet who, you guessed it, didn’t (or perhaps wouldn’t speak English. I am getting better at both understanding and faking, and this time was even able to make simple comments about the wines. I feel very ashamed not to be able to speak the language of the vignerons, but also I am sorry I can’t display both my knowledge and great enthusiasm for wine when I can’t express myself fully. Bernard is a very genial and jovial gentleman, and by all indications a very honest vigneron and winemaker. 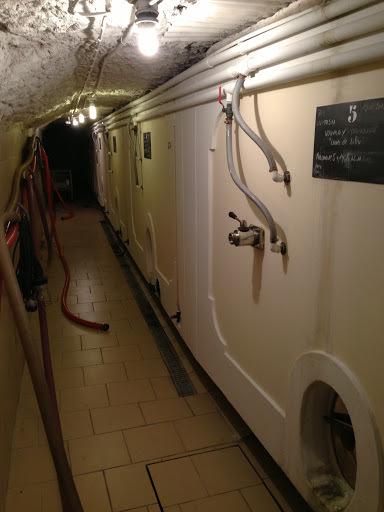 His winery is very simple, but his cellars are both impressive and humble. The ceiling of the area dedicated to tasting isn’t very high, but Bernard isn’t particularly tall so it isn’t a problem for him. By all accounts he is a very well respected winemaker in Vouvray, and having tasted wines from his different terroirs from a number of vintages I can see why. I probably connected with his vouvray wines more than any other I tasted whilst I was there, and it is a shame I couldn’t connect with them more due to language difficulties. 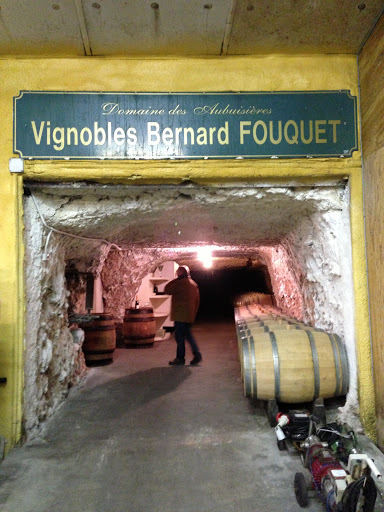 As before the information I am about to give has been provided from Bernard’s website (http://www.vouvrayfouquet.com) and also from The Wine Doctor (http://www.thewinedoctor.com). Bernard took over the running of his family’s Domaine des Aubuisieres estate back in 1982 which also happens to be my birth year. He gained experience working vintage in Burgundy and Alsace where he presumably learnt a lot about both dry wines and sweeter wines. The vineyards are a little spread out from each other in the Vouvray appellation and total 26 hectares which is 18 hectares higher than the Vouvray average. Viticulturally Bernard uses necessary practices, i.e. only using chemicals when necessary. Of the 22 hectares planted to chenin blanc, 21 are hand-harvested and have grass planted between the rows, and the remaining hectare is mechanically harvested. 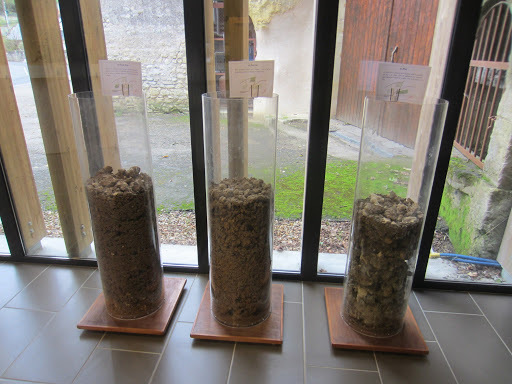 Each terroir is kept and treated separately, and the type of treatment depends on the terroir. Some wines may see some oak whereas other won’t. With so much experience it is hard to argue that Bernard knows the best way to express his terroir in each vintage. Click here to read my tasting notes. The second appointment for the day was at one of the best known estates in Vouvray and also one of the largest; Domaine Huet. Located only a few blocks away from Bernard, Domaine Huet has been owned by the Wong family of Chinese-American origin since 2003. The domaine goes back to 1928 however, when Victor Huet and his wife Anna-Constance returned to Victors roots and purchased a property consisting of a house and three hectares of vineyards. Victor and Anna-Constance’s 18 year old son then went off to viticultural school but soon after her returned France was at war and Gaston was called up to fight. When he returned after the war the vineyards and cellars where in a similar condition to him; broken and dishevelled. Gaston worked tirelessly in the preceding years to not only resurrect the estate but also the appellation which was in the same state, which he did as the mayor of Vouvray from 1947 until 1989. Many great estates and vineyards in Vouvray owe a lot to Gaston and his family. The estate now comprises 35 hectares in the best parts of the appellation. Johan Calonnec welcomed me to the estate both via email and in person. A rugby player he like so many others was a little disappointed I didn’t come from a rugby part of Australia. Much like my French I know enough about rugby to fake it, particularly as he was a follower of union and not league which in my opinion is for meat-heads (sorry Mum). Johan has been with Huet since 2008, five years after the current owners bought the estate. Apparently as the family is of Chinese descent and China is being touted as the devil when it comes to French wine (both in terms of appreciation and acquisition), the locals are a little negative about the new owners. The Wong family seem to be doing an exceptional job however, and as they employ locals who have lived here and worked for this and other estates for many years know what they are doing. 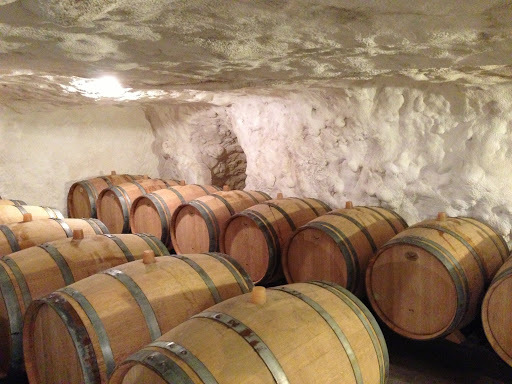 The cellars like many others are wonderful, dating back to the 15th Century when the hills here were quarried for chalk and limestone to build Chateau de Tours. 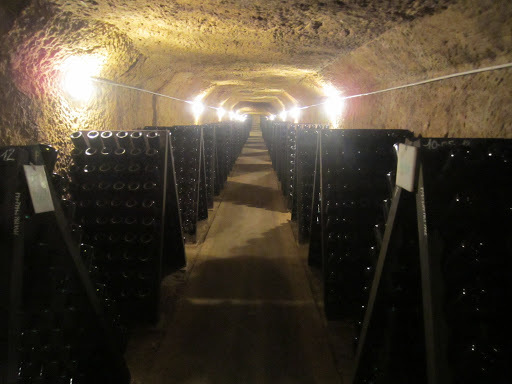 Although sparkling wine represents about 70% of Vouvray only 25% of Huet is dedicated to it and only in certain vintages when the acids are exceptional. The focus is on still wines both dry and otherwise. They have a number of terroirs which are transported into the bottle, and I had the chance to taste across a number of them, all different but all wonderful. Click here to read my tasting notes. Click here to see more photos from Day Two in Vouvray, France.